Look no further for Chuy’s menu prices! Chuy’s is a fun and funky Tex-Mex restaurant chain serving fresh and authentic foods. Chuy’s Tex-Mex menu items consist of flavors and ingredients predominantly from the Southwest US. Each Chuy’s Tex-Mex location offers guests an upbeat, fun, family-friendly experience in an eclectic atmosphere. Chuy’s sets itself apart from the competition with their fresh hand-rolled tortillas, green chiles, 10 signature sauces, roasted hand-pulled all white meat chicken and freshly squeezed lime juice. Below are the latest Chuy’s menu prices. Mon – Fri 4.pm. to 7p.m. Every year, on Elvis Presley’s birthday (January 8), most Chuy’s locations host the “Elvis’ Birthday Bash”, where an Elvis impersonator visits and performs in the restaurant. Chuy’s also hosts an annual “Green Chile Festival” at its locations, celebrating the harvest of the Hatch Green Chiles from Hatch, New Mexico. Chuy’s believes in giving back to the community it serves. Chuy’s partners with local charities, schools or little league teams to fundraise and volunteer. Groups can contact their local Chuy’s location for more info or in-kind donations. Want some Chuy’s swag? T-Shirts and caps can be purchased on the official website. Can’t wait for your order. Just visit your local Chuy’s location to purchase what you need. Let your family and friends experience by giving them the gift of a Chuy’s Gift Card. Chuy’s offers traditional plastic gift cards or guests can send e-gift cards. Traditional gift cards can be purchased online or in store. E-gift cards can be purchased online and sent via email. Chuy’s fans can sign-up to receive the latest news and special offers. Guests just need to provide their email address on the Chuy’s website. Do you like to have FUN when you are at work? Chuy’s is always looking for unique, outgoing team members to join their organization. Chuy’s offers competitive wages and benefits. Interested candidates can learn more about Chuy’s and current openings on the official Chuy’s website. 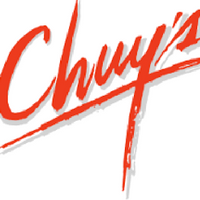 Mike Young and John Zapp opened the first Chuy’s in 1982 in an old abandoned Texas barbecue joint in Austin, Texas. Today, Chuy’s is a publicly traded company with more than 80 locations in 14 states and is still headquartered in Austin, Texas. Fans of Chuy’s can keep up with the latest news on social media or visit their official website.